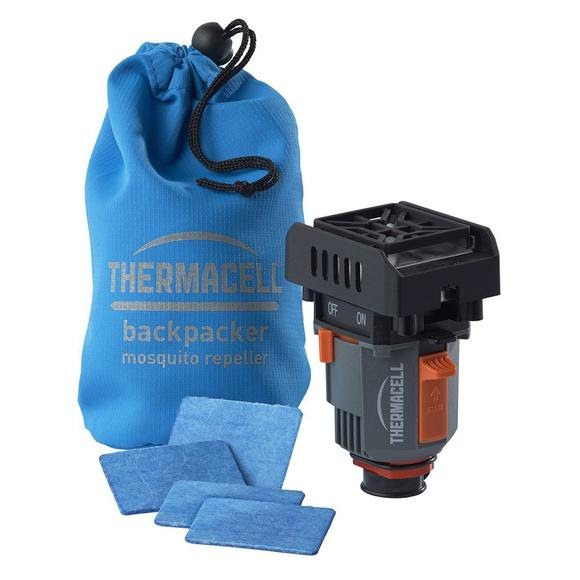 The Thermacell Backpacker Mosquito Repeller effectively repels mosquitoes by creating a 15-foot zone of protection. Utilizing the same camping gas canisters (not included) that backpackers and campers likely have in their bag already, the compact and lightweight Backpacker Repeller is an essential piece of gear. The Thermacell Backpacker Mosquito Repeller effectively repels mosquitoes by creating a 15-foot zone of protection. Utilizing the same camping gas canisters (not included) that backpackers and campers likely have in their bag already, the compact and lightweight Backpacker Repeller is an essential piece of gear. Itâ€™s also ideal for use while fishing, gardening, hunting, around the backyard, and more.